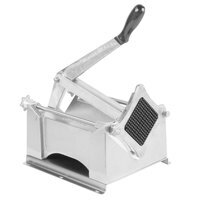 If you run a fast food restaurant or eatery that features fries or potatoes as a favorite side, a potato cutter is a smart investment. 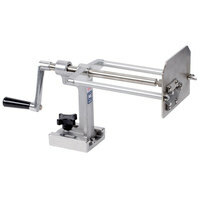 Choose manual commercial french fry cutters for low-volume needs or motorized models for high-volume output. 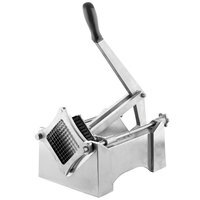 Constructed of sturdy stainless steel and cast iron materials, many of our potato slicers are NSF Listed for sanitation and easy cleaning. 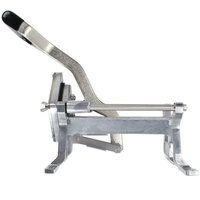 Whether you want to create ribbon, straight, or curly fries, we have a large selection of commercial potato cutters that are fit for your needs. 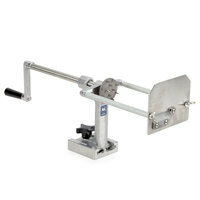 An industrial fry cutter not only produces consistent cuts, but it also optimizes ease by reducing strain on the user's arm. You can pick an option that creates fries of various thicknesses, enabling you to serve fries that range from shoestring to wedge sizes. <h2>Who Invented French Fries?</h2> Both France and Belgium claim to have invented french fries, with origins of the popular dish dating back to the late-1600s. Some believe that British and American soldiers discovered ‘pommes frites’ (French for ‘fried potatoes’) when they arrived in Belgium during World War I, but the term french fries had already been used in America as early as 1899. <h2>How to Cut French Fries</h2> While a chef with good knife skills can cut straight fries or steak fries by hand, a commercial french fry cutter makes the job quick and easy. 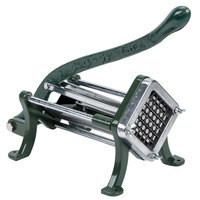 Fry cutters save time and create perfectly consistent fries that cook evenly, batch after batch. 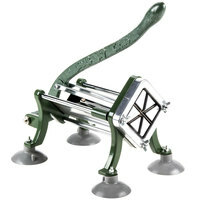 French fry cutters also make it possible to cut a variety of curly, spiral, and ribbon fries, as well as unique garnishes from potatoes and other starchy vegetables that would be difficult or impossible to cut by hand. 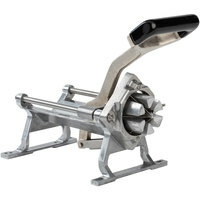 <h2>How to Use a French Fry Cutter</h2> French fry cutters are designed to simplify the task of cutting fries while making it possible to produce restaurant and foodservice quantities in less time. 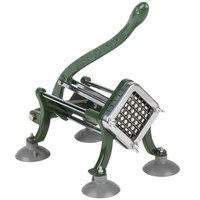 Whether manual or electric powered, all commercial french fry cutters perform in one of two ways. For standard, straight fries and potato wedges, the potato is pushed through a grid of stainless steel blades. Simply insert a potato into the bed of the cutter and push the lever (or activate the switch for powered cutters) to process the fries. 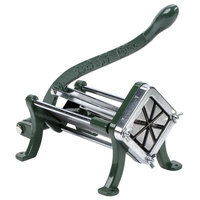 For spiral, ribbon and curly fries the potato is rotated with a hand crank or motorized drive while simultaneously being pushed against a special blade designed for the desired cut. Always consult the owner’s manual for your specific french fry cutter and follow all directions and safety precautions. <h2>How to Cut Curly Fries</h2> When curly fries are on the menu, you'll get the best results by using a real curly fry cutter. The special blade and twist action makes it easy to crank out beautifully cut curly fries that cook perfectly every time. 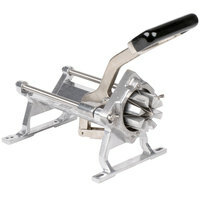 Basic operation of a manual curly fry cutter: <ul> <li>Pull back the crank and drive plate</li> <li>Push the potato or other product onto the fingers of the drive plate</li> <li>Push the drive plate and crank toward the blade until the blade enters the product.</li> <li>Press and turn the crank clockwise to process the fries.</li> </ul> When making curly and twist-type fries, many chefs recommend first cutting a small slice from one end of the potato. This can make it easier to position the potato in the cutter and to start a good cut. 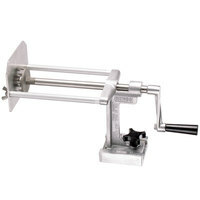 For high-volume establishments, an air or electric-powered curly fry cutter will help you keep up with demand. 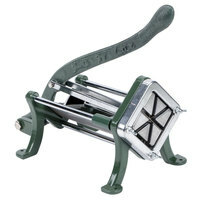 Good - Ideal for cutting whole potatoes into 3/8" wide strips, this Choice 3/8" french fry cutter is a must have for any kitchen serving homemade fries! This unit features a vintage look and a durable cast iron construction for commercial use. 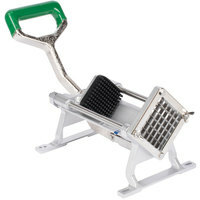 Better - Thanks to its durable cast aluminum construction and short throw handle, this Garde FC38 3/8" heavy-duty french fry cutter is designed for long-lasting, ergonomic use in your kitchen! 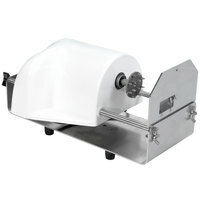 To ensure stability, this cutter can be table- or wall-mounted to suit your preferences. Plus, it can even be used for other ingredients, like peppers, carrots, onions, and more. 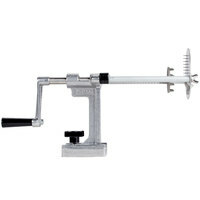 Best - The Nemco 55450-2 Easy Frykutter 3/8" french fry cutter is the tool of choice for operations that make a high volume of french fries on a daily basis. Featuring a cast aluminum construction with stainless steel blades that resist corrosion, this cutter is built for tough commercial environments. Its short throw handle gives the operator enhanced leverage and torque for easy use. Plus, it can easily be mounted to a table or wall thanks to the pre-drilled holes. For optimal convenience, this model can be converted to different cut sizes by swapping out additional blade assemblies (sold separately). 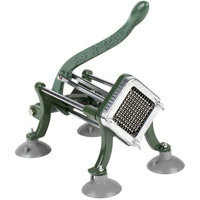 Good - Ideal for cutting whole potatoes into 1/4" wide strips, this Choice 1/4" french fry cutter is a must have for any kitchen serving homemade fries! This unit features a vintage look and a durable cast iron construction for commercial use. 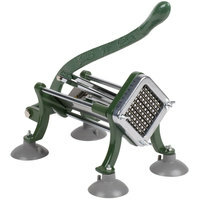 Better - Thanks to its durable cast aluminum construction and short throw handle, this Garde FC14 1/4" heavy-duty french fry cutter is designed for long-lasting, ergonomic use in your kitchen! 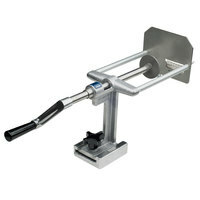 To ensure stability, this cutter can be table- or wall-mounted to suit your preferences. Plus, it can even be used for other ingredients, like peppers, carrots, onions, and more. 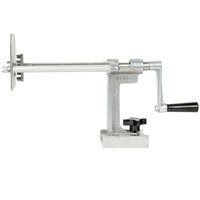 Best - The Nemco 55450-1 Easy Frykutter 1/4" french fry cutter is the tool of choice for operations that make a high volume of french fries on a daily basis. Featuring a cast aluminum construction with stainless steel blades that resist corrosion, this cutter is built for tough commercial environments. Its short throw handle gives the operator enhanced leverage and torque for easy use. Plus, it can easily be mounted to a table or wall thanks to the pre-drilled holes. For optimal convenience, this model can be converted to different cut sizes by swapping out additional blade assemblies (sold separately). Good - Ideal for cutting whole potatoes into 1/2" wide strips, this Choice 1/2" french fry cutter is a must have for any kitchen serving homemade fries! This unit features a vintage look and a durable cast iron construction for commercial use. 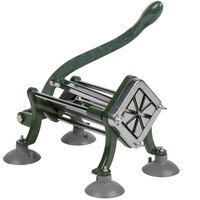 Better - Thanks to its durable cast aluminum construction and short throw handle, this Garde FC12 1/2" heavy-duty french fry cutter is designed for long-lasting, ergonomic use in your kitchen! To ensure stability, this cutter can be table- or wall-mounted to suit your preferences. Plus, it can even be used for other ingredients, like peppers, carrots, onions, and more. 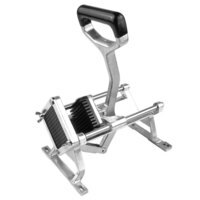 Best - The Nemco 55450-3 Easy Frykutter 1/2" french fry cutter is the tool of choice for operations that make a high volume of french fries on a daily basis. 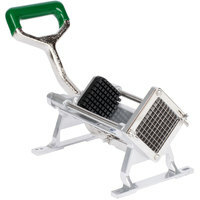 Featuring a cast aluminum construction with stainless steel blades that resist corrosion, this cutter is built for tough commercial environments. Its short throw handle gives the operator enhanced leverage and torque for easy use. Plus, it can easily be mounted to a table or wall thanks to the pre-drilled holes. For optimal convenience, this model can be converted to different cut sizes by swapping out additional blade assemblies (sold separately). Good - Ideal for cutting whole potatoes into 8 wedges, this Choice french fry cutter is a must have for any kitchen serving homemade potato wedges! This unit features a vintage look and a durable cast iron construction for commercial use. Better - The Nemco 55450-8 Easy Frykutter / Wedger is the tool of choice for operations that make a high volume of potato wedges on a daily basis. Featuring a cast aluminum construction with stainless steel blades that resist corrosion, this cutter is built for tough commercial environments. Its short throw handle gives the operator enhanced leverage and torque for easy use. Plus, it can easily be mounted to a table or wall thanks to the pre-drilled holes. Good - Ideal for cutting whole potatoes into 6 wedges, this Choice french fry cutter is a must have for any kitchen serving homemade potato wedges! This unit features a vintage look and a durable cast iron construction for commercial use. 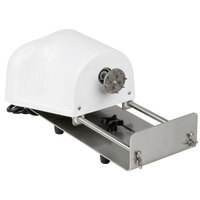 Better - The Nemco 55450-6 Easy Frykutter / Wedger is the tool of choice for operations that make a high volume of potato wedges on a daily basis. 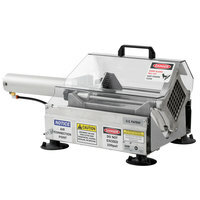 Featuring a cast aluminum construction with stainless steel blades that resist corrosion, this cutter is built for tough commercial environments. Its short throw handle gives the operator enhanced leverage and torque for easy use. Plus, it can easily be mounted to a table or wall thanks to the pre-drilled holes.